In case you need create list off all dimensions used in cube on Microsoft SQL server, with list of all dimension attributes. There is easy and simple way how to do it with query. If you need calculate week number from date, you can use DATEPART with parameter ISO_WEEK. Unfortunately there is nothing like ISO YEAR parameter. In case you need to show YearWeek value in some report you have to take care about correct value manually. Are you looking for simple way, how to get count of distinct values for each column in a table on MS-SQL database? There is a simple script with solution to help you. ..." failed with the following error: "HERE IS IMPORTANT PART". Possible failure reasons: Problems with the query, "ResultSet" property not set correctly, parameters not set correctly, or connection not established correctly. 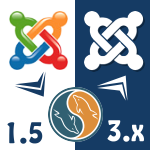 When I migrated one of my web site from Joomla 1.5 into Joomla 3.3 I found there is finally nice feature in Joomla 3.x called Images and Links, which is assigned image to article like thumbnail images in Wordpress. New themes know what to you in responsive templates and it works really nice. Well if you have assigned images. To not do it manully I created parsing SQL scripts, that will help you do it on one click.